In addition to a wide assortment of shrubs, trees, and flowers, decorative landscaping with rocks and stones should also be a consideration as they provide both aesthetics and foundational support when used in retaining walls, barriers, as natural fences, and much more. Choosing the right rocks for your specific project is important and the geographical area you are in must also be taken into consideration. Consulting a rock landscaping professional is highly recommended before starting any such project that incorporates these ornamental rocks. You can, of course, do some DIY rock landscaping but do your research first. Since landscaping companies get big discounts on rocks and stone, oftentimes homeowners find that they didn’t actually save much money on the project and for the time invested, it might not be worth it. Ottawa Home & Garden Landscaping & Interlock is one such company – we get steep discounts on rocks, stone and other rock landscaping materials. 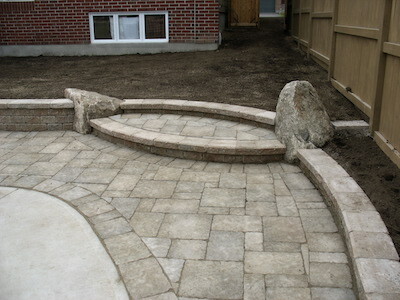 If you’re located in or around Ottawa, contact us for a free rock landscaping quote. Patios– Natural slate and flagstone is both durable and adds a touch of beauty to any patio. For extra durability, you can lay flagstones on top of concrete and fill in the joints with mortar. Small gravel can also be used as groundcover with larger stones as borders. Walls – A variety of landscaping rocks in different sizes and shapes can be used when building garden or patio walls, as well as property line and retaining walls. Mortared walls are the best when it comes to longevity. Hardscapes – Both synthetic and natural landscaping rocks make long lasting structures such as pools, fountains, and barbecue pits. Groundcover and pathways – There are many rock landscaping ideas one can use when building pathways or looking for a unique solution to increase groundcover. Using gravel as a filler in your landscaping project is a great idea and they come in so many different colours and sizes that it can add a whole new aesthetic level to any pathway. Landscaping rocks come in so many different shapes and sizes that it can be hard to choose which ones will go best in your particular project. It is very important to remember that although you may like the look of a particular rock, you need to make sure that it is suitable for what you have in mind. From large granite boulders to crushed gravel, the type of landscaping rock you use will make a difference not only in appearance but also in the strength and longevity of what you’re building. Granite Boulders – They are available in different sizes, are reddish in colour and are quite distinctive. Tatlock Mining Boulders – Come is various sizes and colours such as white, pink, and black. Canyon Stone – Is available in a variety of shapes and textures. Large Landscape Boulders – Adds a level of aesthetic value to a project and are available in different colours, textures, and shapes. Elephant Stone – These stones are full of character and have a pleasing, unique texture. It will add a distinct dynamic to most any landscaping project. Cheetah Stone – If you are looking to add a little pizzazz and colour to your rock landscape, this stone is a must. Both the Canyon and Elephant stone are also available in smaller ‘mini boulder’ sizes and are ideal for accents and rock gardens as well as in ponds and water features. Ottawa Riverstone – Ranges from grey to beige and is available in several sizes. They can be used in place of mulch, in between homes and in culvert areas for drainage. It is recommended that you lay commercial fabric first for weed control. Ottawa Peastone – typically comes pre-set in 3/8” and has all the same uses as the Ottawa Riverstone. Kingston landscaping stones also come in several sizes and can add a lovely touch of colour. They are available in white, pink, red, and quartz. They have all the same application choices as Ottawa Riverstone and can add a nice touch if you do not want to use regular gravel. Rock landscaping is a great way to enhance your outdoor living space and it also adds value to your home. You can create beautiful areas for entertaining as well as natural play areas for children and in most cases, you will also significantly reduce the amount of time you will need to spend on yard maintenance. Professional landscaping is as important to the liveability and enjoyment of your home as interior renovations are. But before you begin any project make sure you bring all your rock landscaping ideas to professionals who can advise you about layout options as well as which landscaping stones or rocks will work best.